Kumar Sangakkara is a great cricketer by any definition. In 134 Tests he scored 12,400 runs at the hugely impressive average of 57.40. His record in 404 ODIs and 56 T20 Internationals is barely less imposing and he is one of the few men to have proved himself a master of all three formats. It should not be forgotten also that he is a fine wicketkeeper who, until he passed over the gauntlets in 2006, had spent years standing up to Muttiah Muralitharan, surely as difficult an assignment as any ‘keeper has had. In 2002 Sanga played in England for the first time. It was ultimately a disappointing series for both him and Sri Lanka, who had gone into the series with real hope after nine straight victories. The first Test began with the visitors piling up 555-8 and taking a first innings lead of 280. England made their own 500 plus total following on and the game petered out into a draw. England won the other two Tests comfortably. In those nine wins Sanga had averaged over 77. In the Tests in England he managed just 21. Sri Lanka visited these shores next in 2006, once again in the first half of the summer. They hung on bravely in the first Test, lost the second and then, thanks to a magnificent spell of bowling from Murali, squared the series in the third. Sanga did better this time, averaging 38.50 with a couple of fifties, but he was nothing like the commanding presence his record suggested he should have been. In 2009 Sanga took over the captaincy from his great friend Mahela Jayawardene. He announced in advance of the tournament that he would stand down after the World Cup in April 2011. He had a prolific World Cup with the bat and led his team to the final, but that match was lost to India. When the Sri Lankan side arrived in England for a three match series a few weeks later Tillakaratne Dilshan was skipper. The first Test was lost by an innings although the second drawn after a brave fightback in the course of which Dilshan broke a thumb. 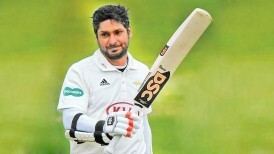 Sanga, in wretched form himself, agreed to take over the reins once more for the final Test, the first to be played at the Rose Bowl in Southampton. Andrew Strauss won the toss and asked Sri Lanka to bat. They totalled 184, and Sanga scored only two. At this point his average in England was exactly 25, against an overall 56.12. England took a first innings lead of 193. There was no reason to expect a Sri Lankan recovery but in fact at long last Sanga came good. He scored 119 and a long partnership with Thilan Samaraweera and the British weather ensured the draw was comfortably secured. Two weeks later came what some consider to be the highlight of Sanga’s career in England. Events unfolded at Lord’s, but not on the field. The occasion was the 2011 Cowdrey lecture on the spirit of cricket, something Sanga had been invited to deliver some months earlier. The late Peter Roebuck described Sanga’s speech as being the most important in cricket history. In it he demonstrated a thorough knowledge and understanding of the history and politics of both Sri Lankan cricket and the nation itself, and delivered an eloquent but nonetheless withering critique of all whose conduct had compromised or jeopardised the integrity of both. Although he had not necessarily expected to do so in 2011 Sanga did return to England for one more Test series in 2014, the two matches that were played before the five match series against India that England won 3-1. Sanga decided this time to familiarise himself with English conditions in advance and played two matches for Durham. In the first he scored a duck, and in the second a century. The acclimatisation was to prove invaluable. The Lankans clung on for a draw in the first Test and took the series with victory in the second. Whatever doubts the English cricket watching public might previously have had about Sanga didn’t last. The 36 year old recorded scores of 147, 61, 79 and 55. Sanga decided to say goodbye to Test cricket at home in 2015 where, in June and August, Sri Lanka were scheduled to play three Tests each against Pakistan and India. In both series he played in the first two Tests before returning to Surrey. His contributions to those games were modest in terms of runs scored, but in each series he helped his country to get to the third Test at 1-1. Without him however both series were lost easily enough, and the realisation of what a world without such a great batsman would be like must have begun to dawn. Back in England the great man seemed to produce further evidence of decline. He helped Surrey to promotion in that first summer with them, and a First Class average of 45.78 is not to be sneezed at, but he was as low as eighth in the Surrey averages. It is true that one of those above him was Kevin Pietersen, his figures for six innings bloated by a not out triple century, but specialist batsmen Ben Foakes, Steven Davies, Rory Burns, Gary Wilson and Jason Roy were all above him, as was the precocious 17 year old Sam Curran. Following Surrey’s return to the top flight in 2016 Sanga’s personal form was much the same as he averaged 49.47. The higher standard of cricket was best illustrated by the fact that this time round that was good enough to see him at the top of the Surrey averages. Of those who had bested him the previous year the closest was Foakes, who averaged 42.16. Sanga also helped the county to win the Royal London cup final, a game they would certainly not have reached without a remarkable unbeaten 130 from him in a quarter final victory at Northampton by just a single wicket. In May of this year Sanga was back for what was to turn out to be his last First Class campaign. Surrey began the season with high hopes, and as early as 7 April started their season against Warwickshire at the Oval. They won by an innings. Opener Mark Stoneman took the plaudits, but Sanga eased into the summer with an innings of 71. A week later the Surrey side gathered once more at the Oval to play Lancashire. It might have been expected to have been an occasion for wearing three sweaters in the field, but in fact the Oval was bathed in sunshine for the entire four days. The home side made a fine start, but a man even older than Sanga, Shiv Chanderpaul, scored 182 and Lancashire recovered to 470. They managed to make Surrey follow on, Sanga scoring 46, but he went on take charge of the second innings. By the time Sanga was out for 136 any prospect of a Surrey defeat was long gone. It was a year since he had last reached three figures for the county. The next century would not be quite so long in coming. Surrey’s first away match of the summer was the return with Warwickshire and a trip to Edgbaston. The game was drawn, Sanga scoring 105 in his only visit to the crease. After that there was a break in the First Class schedule before, more than three weeks later, Surrey made the short trip across London to Lord’s. Middlesex got the better of a draw, but 114 and 120 from Sanga were the innings that prevented the reigning champions from winning. It was only at this point that we were told the end was in sight when, interviewed by the BBC, Sanga explained; You try to fight the inevitable but you need to get out while you’re ahead – this is the last time I’ll play a four-day game here at Lord’s. I’ll be forty in a few months, this is about the end of my time in county cricket. After his announcement the next opponents for Sanga and Surrey were Essex, newly promoted but already on their way to a comfortable victory in the Championship. They reduced Surrey to 31-5, before Sanga and the lower order took them to 369. Sanga scored exactly 200 and was now one more century away from equalling the record shared by Don Bradman and Mike Procter of six in successive First Class innings. He so nearly got there, making 84 in the second innings before becoming a victim of Tom Westley’s occasional off spin. A couple of weeks later Essex came to Guildford and extended their lead at the top of the table. With innings of 4 and 26 Sanga came as close to failure as he would all summer. The broad blade was back in his coffin when he went to Headingley however, an unbeaten 180 being the major contribution to a massive Surrey first innings total against Yorkshire. In the course of the innings Sanga became the first man in the country to reach 1,000 runs for the season. As with all of his innings it was wholly unselfish. On the second morning, when Surrey needed quick runs in order to declare, he added 91 to his score in the first hour of the day. Surrey’s Director of Cricket Alec Stewart echoed the thoughts of many when he commented; I played against him and he was good then, but I reckon he’s getting even better. The Nat West Blast and his commitments to the Jamaica Tallawahs in the Caribbean Premier League meant that Sanga missed Surrey’s next four Championship matches. They certainly felt his absence, being made to follow on by Hampshire at the Oval and then in the return at Southampton recording their lowest all out total of the summer, 200. Normal service resumed after Sanga’s safe return however when Yorkshire came to the Oval and Surrey piled up a first innings total of 592. Sanga, naturally, was top scorer as he contributed 164. The Oval’s final match of 2017, and Sanga’s last appearance there, saw the Brown Caps host Somerset. There was a final flourish for Sanga as he scored 157 in Surrey’s first innings, prompting the visitors’ skipper Tom Abell to say; You’ve got to appreciate genius when you see it. Having previously won just once all season Surrey did manage to get into a winning position and the scene was set for Sanga to say farewell by scoring the winning runs. He advanced serenely to 35 by carrying on where he left off in the first innings. At this stage only fifteen runs were needed, but then Sanga drilled the ball straight back at Dom Bess and was caught and bowled. Initially there was a stunned silence, before the standing ovation that was so richly deserved. The man himself was typically gracious and self-effacing; I thank Surrey for allowing me to rediscover that immense love and passion that First Class cricket and cricketers have for this game. Sanga’s final First Class match, deep into September, was at Old Trafford against Lancashire. The two counties began the match as the only two in Division 1, champions Essex apart, who were not involved in the relegation dog fight. The Red Rose came out on top. In the first innings Sanga scored a mere 14, and in the second innings, after Surrey had made a good start, he had to watch whilst his teammates collapsed against the part time leg spin of Liam Livingstone. He was still there at the end unbeaten on 35, thus the promising young Lancashire seamer Saqib Mahmood will carry through his career the memory of being the last man to dismiss Kumar Sangakkara in the First Class game. The summer ended for Sanga with a tally of 1,491 runs at an average of 106.50. No one has ever bettered that average in a county season, and only one man, that Australian, has ever exceeded it in an English summer. Sanga’s numbers mark him out as one of the greatest batsman the game of cricket has seen and his career does illustrate one of the benefits of the T20 game. He may be gone in the longer forms of the game, but he will doubtless be around in the shortest format for a while yet. I wish him well.